Takapuna Yacht introductory special charter rates. Great introductory special offer for 1-8 guests $39,900 plus all expenses - 20% APA. Takapuna has a professional crew of 5. Offer valid with signed contract and deposit made prior to Sept. 1, 2011. 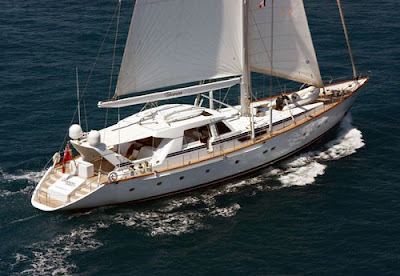 Charters may take place in 2011 or 2012 for charters in St. Marten, BVI or down island. Inquire for down island deadhead fees. Offer not valid for Christmas, New Years or charters of less than 7 nights. Powerful and luxurious, at 112' TAKAPUNA offers high adventure and excitement plus an amazing amount of interior and deck space to lounge, dine, sunbathe and dance under the stars. Staffed with a world class crew of 5, no details are overlooked and service is truly five star. She is equipped with numerous water toys and a fabulous walk down stern for easy access to the water or the tender. The crew will customize your vacation to include any combination of activities or relaxation to satisfy your desires and exceed your expectations. The crew is fun-loving, with diverse backgrounds to help create singularly enjoyable memories that will keep you coming back time and again.